now Offers End Mills Smaller than .001"
Through literally thousands of hours of research and development, Performance Micro Tool has been able to manufacture end mills as small as 5 microns in diameter. Today, we offer a line of nano-sized tools from 5 to 400 microns in diameter. These high performance tools are in use for prototyping, full-scale production and academic research. Call us at 1-866-737-3676 to learn more about our nano-sized tools. 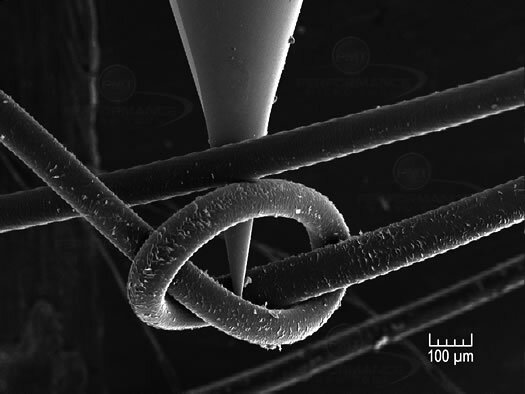 Human hair tied in a knot shown next to 25µm end mill. Leg of an ant shown next to 10µm engraving tool.